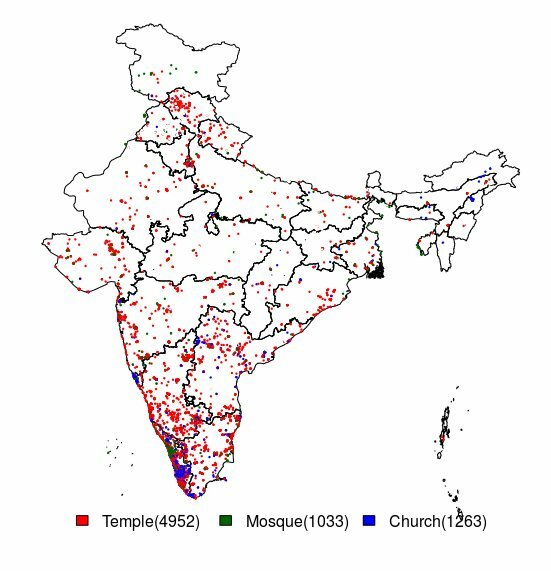 The numbers in parenthesis gives the total number of places of worship as present on the Open Street Map. Although, Christians are fewer than Muslims, but they tend to have much larger presence according to this data. Data Source: http://download.geofabrik.de/asia/india.html (OpenStreetMap). These maps don’t show complete picture as things are updated all the time, but gives a general direction. The information plotted here was updated yesterday. Map Generated in R. Email/tweet if you want the source code.